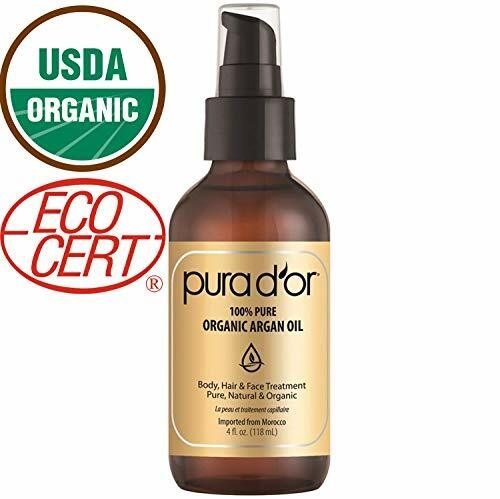 Argan oil is best known for its moisturizing effects and its ability to repair damaged hair. Apart from that, there are also other benefits of argan oil including clearing up of acne and healing of the cracked and damaged skin. Due to the many benefits that this oil brings, many customers are seeking to buy it. However, its supply is limited. You will find various types of argan oils on the market, but not all of them are pure argan oils. 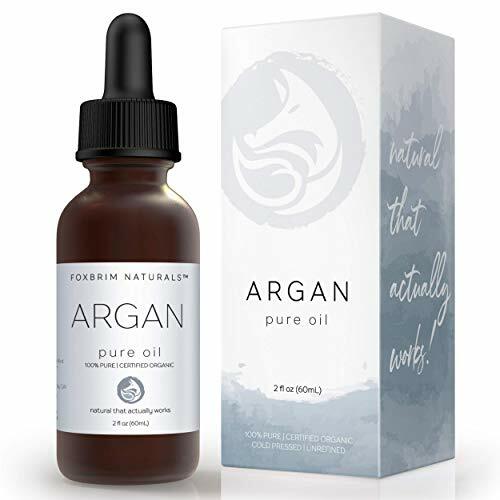 Oils that do not contain pure argan oil will not provide you with the best results, meaning that you will have wasted your money on the purchase. The Viva naturals is a 100% pure “liquid gold.” It is cold pressed from the sweet kernels of the Moroccan tree to protect its essential nutrients and color, meaning that it is 100% natural. The oil is free of hexanes, unwanted additives, while it is also undiluted. Even better, it has an organic certification and is third-party tested to ensure that it is safe for you to use. You can use this oil to tame frizziness naturally. The reason behind this is the gentle ultra-hydrating properties that make it add shine to wet or dry hair, enabling it to tame flyaways and restore the brittle ends on your hair. This oil acts as a natural source of antioxidants, essential fatty acids, and vitamins A and E. As such, you can apply it on a daily basis to add shine and smoothness to your hair and nails. What’s more is that you can use it as a regular moisturizer for you to get a healthier-looking and younger-looking skin. This oil has no added fragrance but only its natural scent. Hence, you can be sure that it will not disgust once you apply it. Cold pressed from sweet kernels of the Moroccan tree to protect its natural ingredients, color, and aroma. Hexane-free, undiluted, and free of unwanted additives. Natural source of antioxidants, vitamin A and E, and essential fatty acids. Foxbrim is one of the top argan oil brands for those who want a 100% pure organic argan oil. It is cold pressed and unrefined, meaning that it has its ingredients, color, and aroma are natural. The oil is rich in fatty acids and vitamin E making it an excellent moisturizer. You can use it as a leave-in conditioner to calm frizzy ends, nourish and strengthen your hair, as well as encourage your hair to shine. More to this is that you can apply it on your face as a daily moisturizer. Even better, you can use it to reduce redness from acne or treat eczema and psoriasis since it features anti-inflammatory properties. The oil can also serve as a preshave oil as well as a natural lip moisturizer. What’s more is that it helps hydrate under-nourished skin making it a great plus for use on the body. It works perfectly to eliminate stretch marks and repair cracked heals, nails and cuticles. Once you get it, you can be sure to have a safe product for your body since it is USDA certified. The oil comes in a 2 fl. oz dark bottle which protects it from direct exposure to sunshine. No added fragrance, and additives. Also known as “liquid gold,” this is the anti-wrinkle and anti-aging secret. The oil is 100% cold pressed from the kernel nuts of the Moroccan argan tree so that it retains its ingredients, color, and smell. This oil is rich in antioxidants and vitamin E, making it a great plus for use to restore luster and bring about shiny and healthy hair. It helps to sooth the skin and unclog hair follicles to promote hair growth. More to this, it helps to reduce dandruff, and strengthen weak and damaged hair. Another plus is that it hydrates and revitalizes the skin, enabling you to fight signs of aging. As such, you can be sure to have a firm-looking and young-looking skin after a continued use of the oil. The oil is also perfect for use on delicate cuticles and nails since it can restore the proper look of your nails. Its ingredients meet the arts naturals’ 100% natural standards. They are also paraben and cruelty-free making it safe for use. Manufactured in the USA, this oil meets the highest manufacturing standards. It is 100% pure cold-pressed from Moroccan Argan tree enabling it to retain its natural ingredients. The oil does not include added chemicals making it safe for you to use on any skin type and hair type. What’s more is that it is USDA organic certified. As such, it is sulfate free, parabens free, and does not contain any pesticides, synthetic fragrances, gluten, or substances that will bring about a reaction with your skin. The oil is safe for use on the skin, hair, nails, and face. As one of the best argan oil for face, it has anti-inflammatory properties to help fight inflammation and treat eczema and psoriasis. Moreover, it has moisturizing properties. As such, it helps promote a healthier skin and shining hair since it works to strengthen the skin and hair cells. Apart from that, the oil is effective in promoting a healthy hair growth. This is due to its ability to provide hair follicles with the required nutrients for a strong and healthy hair growth. You can use it to revitalize chronic dry skin since due to the soothing power of argan oil. Even better, you can apply it to reduce aging properties since it can restore elasticity, and soften wrinkles and fine lines. The pump lid leaks when applying and it is hard to use it when the oil is about to end. 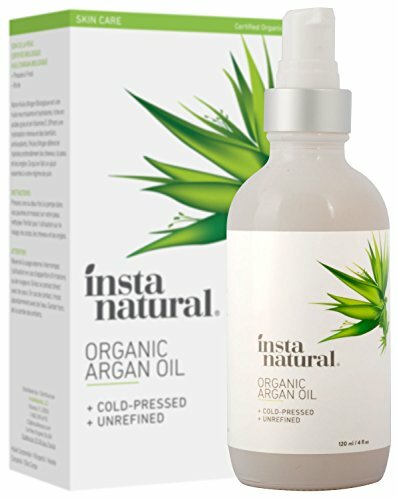 This oil is 100% pure and cold pressed from the Moroccan Argan tree. It is perfect for use on the nails, dry scalp, split hair ends, as well as eliminating stretch marks. It is a great moisturizer hence perfect for use as a leave-in conditioner to moisturize and protect your hair against breakage. It also works perfectly with the nails, since it moisturizes cuticles to restore weak and brittle nails. What’s more is that it is perfect for use on the skin since it penetrates deep into the pores to hydrate dry, peeling, and damaged skin. The oil is USDA, and ECOCERT certified to ensure that it is safe for use on all skin type. It does not also contain chemicals, artificial fragrances, or preservatives. As such, it works naturally when hydrating and softening your skin. 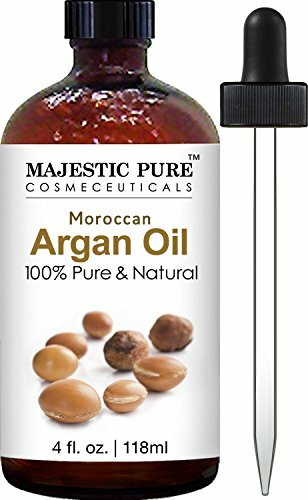 This is a 100% natural argan oil that is cold pressed from the nuts of the Moroccan tree. As such, it has natural ingredients, smell, and color. It is perfect for use on the beard, hair, face, nails, and cuticles. The oil is rich in fatty acids, Vitamin E, and antioxidants. As such, it is perfect for moisturizing the skin, restoring and strengthening damaged and brittle hair. What’s more is that it is perfect for use in reducing aging properties. This is due to its ability to tighten the skin reducing the appearance of fine lines and wrinkles. 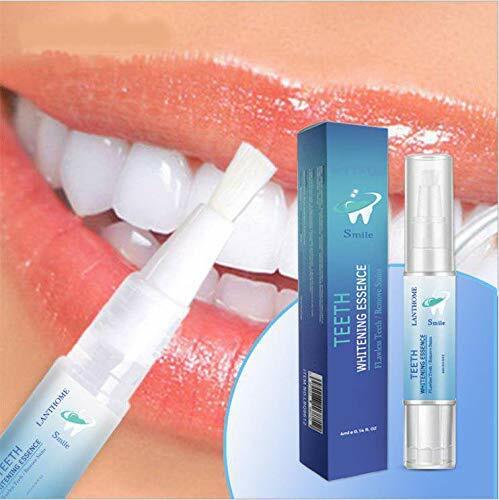 You can also use it to promote healthy lips and heels. 4 fl. oz. dark bottle package to protect it from exposure to sunlight. It is rich in natural antioxidants, Vitamin E, essential fatty acids. 100% cold pressed from Moroccan Argan tree nuts. As one of the best argan oil for hair growth, this oil is perfect for regenerating and nourishing damaged hair. It can protect your hair from the damage caused by heat styling and the environment. The oil is rich in Omega 6, essential fatty acids, and vitamin E since it is derived from the Agan tree. As such, it soothes the hair cuticles while it hydrates the skin for a more nourished hair growth. Moreover, it is non-greasy and alcohol-free. As such it is safe for you to use while it does not leave an oily-greasy appearance after applying. With this oil, you can be sure to eliminate frizz and get a shiny and manageable hair. What’s more is that once you use it on a long-term basis, it helps protect the hair from UV while it helps to reduce to reduce split edges. The Pure Body Naturals is extracted from the kernels of the Moroccan Argan tree. It helps to maintain your hair soft, silky, and shiny without making it greasy. The oil features jojoba and avocado, which bring about a deep nourishing hair repair. As such, you can use the oil to revive broken hair. What’s more is that it includes natural vanilla and honey. These are added to bring about a refreshing aroma, making the oil have a bearable smell. More to this is that it has included Almond. This works with Jojoba to bring about a soothing effect on itchy and inflamed scalps by providing them with vitamin D and Olein Glyceride Linoleic Acid. As such, it helps treat dandruff and dry scalp. The oil contains Vitamins A, B1, B2, D, and E, as well as antioxidants due to the added avocado oils, camellia seed, and peach kernel. It is hypoallergenic and sulfate-free to ensure that it is safe for use by persons with sensitive skin. 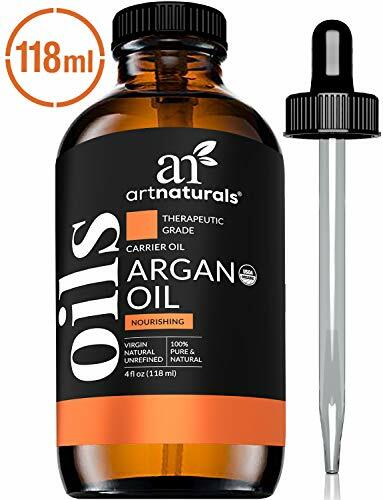 This is a 100% pure organic argan oil. It is cold pressed from sustainable organic argan nuts, which makes it retain its natural ingredients, smell, and color. The oil does not feature any added products, while it has nothing removed out of it. As such, it has great hydrating and moisturizing properties, which makes it one of the cool argan oil brands. It quickly absorbed into the skin and scalp to moisturize dry skin. It also hydrates frizzy and problematic hair, while it also restores damaged and brittle hair. The oil is perfect for use on all skin types since it does not include parabens, added colors, and fragrances, or fillers. It acts to moisturize your skin due to its richness in essential fatty acids, vitamin E, and natural antioxidants. What’s more is that has anti-inflammatory properties, which make it great for treating eczema and psoriasis. You can apply the oil on the face for a younger and radiant skin. Even better, you can use it on damaged nails, heels, and lips. No added colors, fragrances, or parabens. It makes the hair soft, smooth, and silky. Despite this product being at the bottom of our list, it is one of the top level argan oil for face. It is a pure cold-pressed argan oil, meaning that its smell, color, or ingredients have not been altered. As such, it is great for use on all skin types since there are no ingredients to make it react with your skin. The oil has a USDA and EcoCert certification to ensure that it is 100% natural and safe for use. You can use it for the face, hair, skin, and nails. It acts to infuse the skin with natural anti-aging ingredients such as vitamin A and E, which allows you to have a younger and vibrant skin for an extended period. What’s more is that it helps calm inflammation. As such, you can apply it on an itchy face to help reduce eczema and acne. More to this is that you can use it to condition your hair. It contains vitamin A, and E, as well as anti-oxidants, omega-6 fatty acids, and linoleic acid. As such, it helps protect the hair from damage caused by the heat, while it also helps tame frizz, split ends, and flyaway. Rich in vitamin A and E, omega-6 fatty acids, anti-oxidants and linoleic acid. Free from parabens, fragrance, preservatives, and alcohol. Champion argan oil for face or hair growth should be 100% argan oil. Ensure that the bottle of the oil you buy has the label 100% argan oil or 100% Argania Spinosa. These ensure that your oil is 100% natural and that it has not gone through a process to tamper with the color, smell, or ingredients. What is the packaging of the argan oil you are about to buy? Note that argan oil is prone to oxidation and shouldn’t be directly exposed to sunlight. As such, genuine manufacturers pack it in dark containers to avoid direct sunlight contact. So, ensure that you get your oil in a dark bottle which can also be amber, green, or blue. The smell of the argan oil should give you an idea if you are about to buy the ideal argan oil brand. Real and authentic brands should have a light and nutty smell, which can be quite noticeable by those with a strong sense of smell. However, this smell goes away once the oil gets absorbed into your skin. What’s more is that the color of the oil should be a light yellow golden color. Ensure that the oil you get does not have a light yellow color since this can be an indication that it is mixed with other oils. Apart from the smell, the texture of the oil should serve to tell you if you are getting the grand argan oil. Argan oils should not be too thick, and at the same time, they shouldn’t be too light. Moreover, it should not be greasy after applying, while it should not give a lasting slippery feel after using. So, ensure that your oil is not greasy and that it quickly absorbs into your skin. Finally, have a look at the price. Note that pure argan oils are not cheap, due to the tiring manufacturing process. So, be cautious of sellers who may offer you the product at a low price. To be on the safe side, have a look at the costs of the argan oils based on the quantity and ingredients to have an idea of the price range. 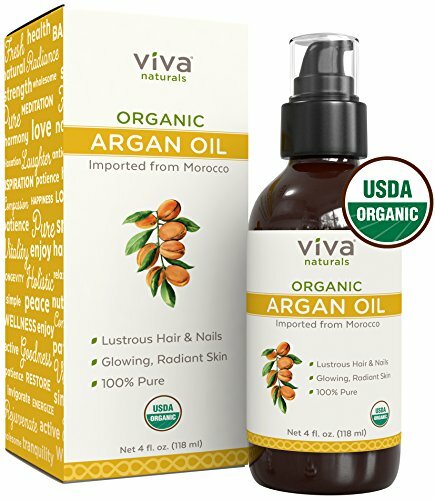 I recommend that you try Viva Naturals Organic Moroccan Argan Oil since it includes the properties that the perfect argan oil should feature. It is a 100% pure argan oil, while it is free of preservatives, hexanes, and water. The oil also features a natural scent and the certifications required to ensure that it is safe for you. Hence, be sure to try it for the best value for money. Being a big well known company doesn’t necessarily mean good/ pure product. We would like for you to consider Argania Elegantia Certified Organic and Pure Argan Oil. It comes directly from Morocco and has all the pros with no negatives as you mention. Give us a try. we would love your feedback. I send the query to our review team. They’ll inform you shortly after doing proper research. Yes, It has a slightly (growing) rancid odor. We don’t recommend it. I am a big fan of argan oil. Nice Review. Hi, great info on companies new to me. 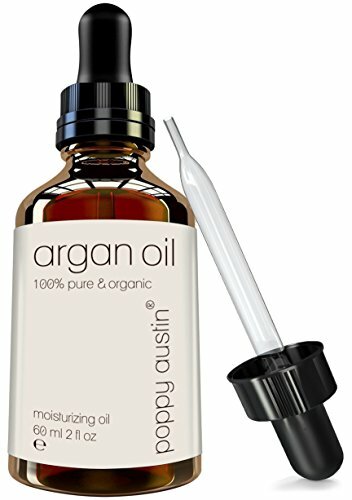 I noticed Josie Maran argan oil was not listed in the top ten, is there a reason why (purity) wise?